The new age is a time represented by numerous mobile devices, computers in each house and workplace, and the internet, so we come across these gadgets practically every day. Still, although technology has many perks and simplifies our life, the regular use of these gadgets, especially by children, can cause some serious health issues, such as obstructing the mental and physical development. Children heads are twice as prone to radiation absorption, and their skull’s bone marrow absorbs ten times the radiation when compared to adults. This can lead to cancer, brain tumor and other brain abnormalities. 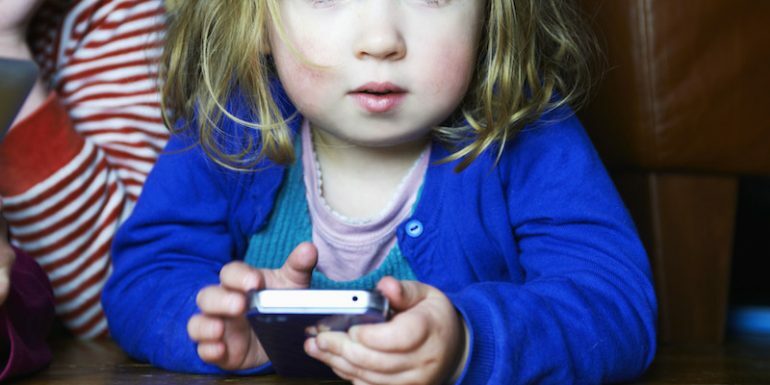 The more a child relies on the use of technology, the more anti-social they become. They have trouble communicating in terms of choosing the appropriate tone, gesture, body language, phraseology and facial expressions. The use of mobile phones and other blue screens can worsen the quality and amount of sleep, and we all know that children need this in order to develop properly. It can negatively affect their psych and physical growth and well-being. As much as you try, controlling what your child has or doesn’t have access to on the Internet, is almost impossible, particularly when it comes to games, and all sorts of videos. The internet’s entertainment is a huge distraction and can be responsible for attention disorders, damaged visual memory, lack of focus and imagination and laziness. Continuous screen use might strain the eyes of both adults and children, followed by sore eyes, migraines, and impaired vision. Scientists have discovered that media and technology have a negative effect on the health of children and adolescents, emotionally as well as physically. Children get more sensitive and prone to depression, and social and learning difficulties. The long time period spent on these gadgets can ruin the children’s posture, which may further along cause some sort of musculoskeletal disorder. The time spent on these electronic devices is usually spent sitting for longer periods, in other words, lack of physical activity which leads to obesity. Moreover, children who spend most of their time using cell phones, tablets, computers, and video games, tend to snack more and thus consume more calories. The internet addiction has been linked to the frontostriatal pathway, the exact neural pathway connected to drug addiction and gambling. Check out the video below to learn how to stop your children from getting addicted to these malicious screens!